PHUKET ISLAND, THAILAND--(Marketwired - Jan 20, 2017) - Going green can mean different things in different parts of the world, but in Thailand it can be downright literal. Case in point: The Renaissance Phuket Resort & Spa, JW Marriott Phuket Resort & Spa, JW Marriott Khao Lak Resort & Spa, Phuket Marriott Resort & Spa, Nai Yang Beach and Phuket Marriott Resort & Spa, Merlin Beach recently undertook reforestation efforts in the mangrove forests of Baan Tub Pla and achieved inspiringly verdant results. Located in the Phang Nga province, an area on the west coast of the Malay Peninsula that's known for its limestone karsts and natural beauty, Baan Tub Pla was identified by the International Union for Conservation of Nature (IUCN) in 2014 as in need of reforestation due to illegal encroachment by palm oil and coconut plantations. Marriott associates quickly rose to the challenge. After successfully replanting the site, they were again called upon to replant a new 17-acre site in the same area. 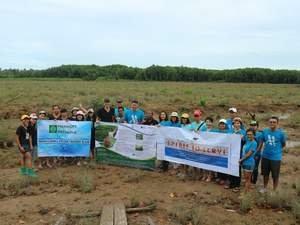 So on December 7, 2016, more than 60 associates from the Renaissance Phuket Resort & Spa, as well as four other Marriott hotels, joined forces to turn this corner of the world a very important shade of green. Mangrove forests are critical components of intertidal zones, as they help to reduce erosion, offer habitat to fish and other organisms and generally support coastal systems. Reforestation efforts at Baan Tub Pla are expected to continue for at least five years while relying heavily on the engagement of the local community as well as the quarterly volunteer efforts of this five-star Phuket hotel. The same commitment demonstrated by the Marriott team to improve the planet is applied on property as well. This award-winning Mai Khao resort welcomes visitors with a blend of modern technology, indulgent amenities and sleek beach living, all of which associates complement with attentive, friendly service. The hotel's convenient location also puts the area's best attractions -- from the dive sites of Phi Phi Islands and unspoiled beaches of Mai Khao and Surin -- within easy reach. From local green initiatives to global hospitality, the Renaissance Phuket Resort & Spa is working to improve the quality of life on the planet, one stay and one tree at a time. Situated along the white and azure shores of Mai Khao Beach, the Renaissance Phuket Resort & Spa embraces the majestic landscape with enticing indoor-outdoor architecture, luxurious amenities and attentive service. Guests can indulge in a variety of luxury accommodations, from deluxe guest rooms to opulent one- and three-bedroom villas with plush bedding, marble bathrooms, tropical views and the occasional private plunge pool. The full-service Quan Spa expands on the restorative properties of the resort, while the nearly 3,000 square feet of event space hosts conferences, weddings and even the occasional beach meeting with a blend of modern sophistication and island style. The hotel's restaurants, meanwhile, have carved out a niche within the Phuket dining scene, offering traditional Thai fare, seasonally-inspired cuisine and hand-crafted cocktails at its five venues.